"This book, with its sabre-rattling overtones, resurrects long-forgotten rivalries with flair and poignancy." Notorious for its recent military dictatorships, South America is less well known for its wars. But since the dawn of independence in the early nineteenth century, the continent has witnessed a series of conflicts, some short and small-scale, others long-lasting and extensive. Battles have been fought over serious issues border disputes, trading disagreements and oil wealth but blood has also been spilt over such seemingly trivial matters as manure and the result of a football match.The heyday of South American war-mongering was the nineteenth century, and it is this period that Andrew Graham-Yooll reconstructs in this history of ‘small wars’. Many such conflicts amounted to little more than sabre-rattling and cost little human life. But not all hostilities were small or trivial. More than 400,000 troops and civilians died in 1865-70 when Paraguay went to war with Argentina, Brazil and Uruguay in the continent’s greatest military disaster.Looking at the role of foreign powers such as France and Germany in the region’s instability, this book also considers how Britain treated the continent as part of its empire with a policy of gunboat diplomacy. Using press reports, unpublished correspondence and first-hand recollections of battles and skirmishes, it analyses how distant wars were viewed in Europe and how they affected the people who actually fought them.In this revised and updated edition, Graham-Yooll also looks back at the Falklands War in the context of earlier foreign adventures in South America. 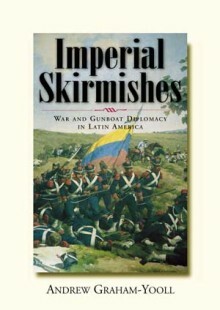 Revealing for the first time the true extent of European involvement in Latin America’s internal strife, this book captures the imperial ambitions, the belligerence and the incompetence of Victorian generals and profiteers. ANDREW GRAHAM-YOOLL was born in Argentina, where he is Senior Editor of the English-language Buenos Aires Herald. He was exiled during the military dictatorship of the 1970s and returned to Argentina 18 years later. He is the author of Portrait of an Exile (1982), A State of Fear (1986) and After the Despots (1991).